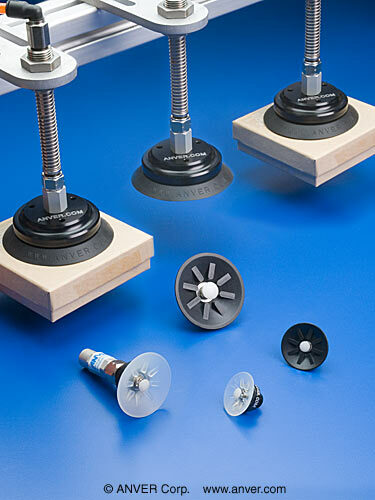 A line of suction cups featuring a vacuum attach probe with an internal check valve that remains closed until it touches a load, to prevent air loss and improve automation equipment efficiency is available from ANVER Corporation of Hudson, Massachusetts. The ANVER Vacuum Probe Cup features a small, spring-loaded Delrin® probe that actuates a normally-closed internal check valve which allows vacuum to be created only when a load is present. Designed for large pick-up arrays used in high cycle applications, these rubber vacuum cups prevent air loss and save energy to improve the efficiency of automation equipment. By maintaining vacuum at the cup, the ANVER Vacuum Probe Cup is offered in 10 sizes and provides instant attach-and-release. The Delrin® probe protrudes slightly from the center and touches the load first to permit vacuum flow. Applications include feeding equipment, processing, and packaging lines.